One of my favorite podcasts, Note to Self, recently streamed an episode that got me thinking about the intersection between attention spans, ADHD, work, and technology. When someone is interrupted at work, it can take up to 23 minutes for them to refocus on the previous task at hand. It sounded pretty extreme until I considered what it’s like for me to be distracted when I’m on a roll writing a blog article, scheduling social media content, or researching. Usually it’s something like a HipChat message, or a coworker laughing or talking that breaks my concentration. It’s like emerging from underwater. When the distraction has passed, I turn back to what I was doing and the trajectory I was on isn’t as clear. What was my next move? Why did I open this new browser tab again? I can gather the pieces back together, but it takes a few minutes. There’s a growing cultural feeling that we’re distracted all the time. With so many devices (smart phones, TVs, computers, tablets) and notifications competing for our notice, many of us feel our attention spans have gotten shorter and shorter over time. Is this true? To find out, I decided to take a deep-dive into the research. If you’ve got your own stories to share, be sure to leave a comment for us. Are short attention spans and attention deficit disorders the new norm? There’s a lot of emphasis in media headlines about ADHD (Attention Deficit/Hyperactivity Disorder) effects on kids and teens, but the symptoms in adults are very similar, and can be just as negatively impactful. Reading that list, I’m sure you can think of people you know (maybe even yourself) who exhibit at least a few of these traits. 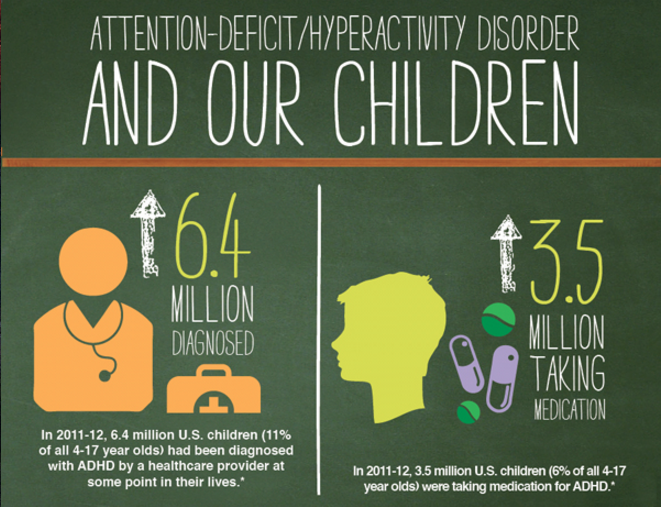 Infographic on ADHD rates by the U.S. Centers for Disease Control and Prevention. In the United States alone, the rates of ADHD diagnosis are on the rise in both children and adults. At this point, 11 percent of school-aged children and 4.4 percent of adults have been given a medical ADHD diagnosis. What is causing this perceived rise in the number of people experiencing ADHD? Some experts think that part of the reason why so many people now fit this criteria is simply because we’ve gotten better at diagnosing ADHD and there is less stigma surrounding it as numbers grow. 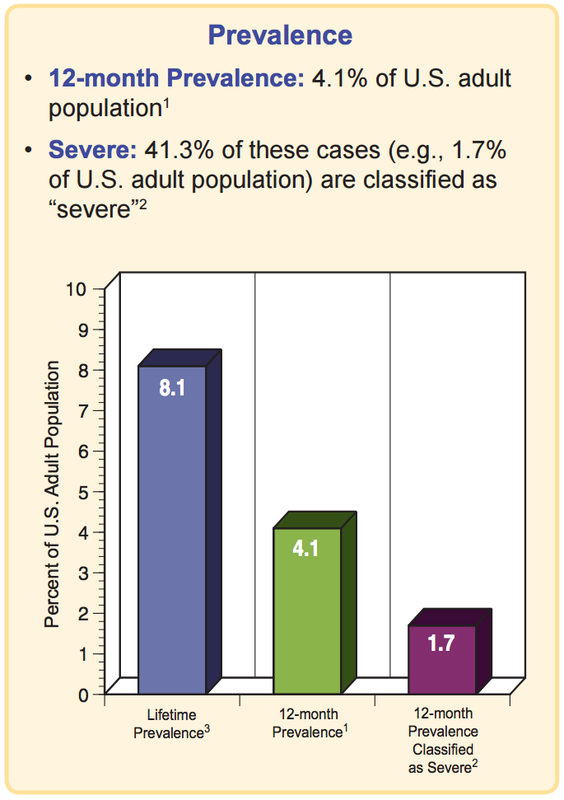 Infographic on rates of ADHD in U.S. adults from the National Institute of Health, data from 2005 (this number has now risen to 4.4 percent). However, child psychiatrist Dr. Victoria L. Dunckley notes the many ways that our modern lifestyle of staying largely indoors using devices with screens affects our bodies and brains and is probably contributing to the problem. Being outside is linked to improved focus, an elevated mood, and a healthier body, so why are we spending so much time indoors? Could it be that screens have us in their grip? According to the U.S. Environmental Protection Agency, we are inside a building or vehicle for 93% of our lives. The link between screen time, attention, and being outdoors is a bit of a chicken-and-egg problem: If you’re inside, it makes sense that you’d reach for a device with a screen for work or entertainment, and of course, if you’re staring at a device you’re unlikely to be outside. Okay, that’s a bit of an exaggeration, but sadly not too far from the truth. “Screen time,” or time spent staring at a screen on a device, is linked to a lot of negative influences on our brains, from disturbed sleep patterns, to—you guessed it—our attention spans. Why is that? The short answer is that when our brain identifies something as a “reward,” we feel the positive effects of the naturally-occurring brain chemical, dopamine. Novelty, such as a notification popping up on your phone (especially a novelty that is already linked to something positive like a social connection or progress in a game) registers as a reward to your brain. Screens are essentially a reward-factory for the brain: points on a video game? Dopamine. Friend request on Facebook? Dopamine. And you know what pales in comparison to a dopamine rush from stimulation on a screen? Sustained attention on an activity or task that isn’t providing any immediate reward. It’s a harsh truth, but the average adult looks at a screen pretty much all day at work and almost all day when not at work. The latest research indicates it’s around 11 hours per day. Unless new technology completely revolutionizes how we work and play, that’s not likely to change anytime soon. Maybe a short-attention span is the new normal. Glad you asked. The answer, happily, is a resounding yes. There are a lot of things that you can do (outside of going on Adderall) to improve your focus and help your brain function better. If camping and hiking aren’t your cup of tea, don’t sweat it. Going outside does not have to be a big production; take it literally and just go outside. If a store or workplace is close enough, walk there. If you have a few minutes to take a break and get a cup of coffee, grab a coworker and walk a couple of blocks. You’ll get a little vitamin D, fresh air, and exercise all in one go. With any luck, you’ll get back to work refreshed and ready to concentrate. “Let food be thy medicine, thy medicine shall be thy food,” said Hippocrates. When it comes to improving focus and lengthening your attention span, many people agree that diet is key. Healthy eating is seen by the medical community as important for brain health, including the ability for sustained concentration. Stick with whole, nutrient-rich foods like fruits, vegetables, and unprocessed meats and grains. Avoid foods that are heavy with sugar, saturated fat, and carbohydrates. This applies to everyone, and generally keeps your body operating at its best. Mind your micronutrients. Do you have an iron deficiency? Are you getting enough B vitamins? If you live in a cold climate in the winter, where are you getting your vitamin D? Deficiencies in these vitamins and minerals can increase attention problems. Take a daily multivitamin or make sure your diet provides enough. Avoid additives. Are you eating food that has been dyed red or yellow? Studies have shown that food dye (especially red and yellow dye) and food additives such as MSG and aspartame can increase feelings of hyperactivity. It certainly won’t hurt to cut these artificial chemicals out of your diet. Eat brain-feeding foods like protein and omega-3 fatty acids. Keeping your diet rich in protein from healthy things like nuts, fish, and beans, and getting omega-3s from similar sources like salmon and olive oil, will help you concentrate. There’s data behind this recommendation. One study found participants completed tasks more accurately after drinking black tea, saying that they felt more alert. Not a huge black tea drinker myself, I decided to try it out and see if I felt a difference. My self report? I really did feel a little more alert. As a result I’ve started to drink black tea more often. Decide on places or times that you will not use your phone, tablet, laptop, etc. Good examples include: at the table or while eating, in bed, or in your bedroom in general. Download an app such as Minute, which tracks how much time you spend on your smartphone. Once you hit a certain point during the day (say 90 minutes), that’s it! No more for the day (except for emergencies, of course). Sleep (as I’ve written about before) is crucial to your quality of life and general well-being; sleep deprivation is a factor in everything from low libido to high blood pressure. Your ability to pay attention is definitely not immune to taking a hit from too little sleep. Not only does lack of sleep impair your concentration, but it makes you more likely to make mistakes and makes it more difficult to solve problems. Watching one more episode of your favorite show on Netflix is just not worth it. Meditation’s beneficial effect on focus has long been documented, and something as extreme as ADHD isn’t outside of its wheelhouse. One of the huge benefits is that you need nothing but time and your own breath to do it, and you can start right away. Simply close your eyes, sit in a comfortable position, and focus on your breathing slowly going in and out. If you lose your focus, don’t worry, just try again. A good amount of time to start with is 10 minutes. You can set your phone timer. Keep it simple and don’t judge yourself if it’s hard at first, just keep trying and it will get easier (that’s the point). Trust me, I’ve done it. Some days are better than others. There will probably be a day when you spend the 10 minutes literally just getting distracted and then bringing the attention back to your breath, over and over. It’s okay. Those are probably the days you need it the most! If you’re new to the idea of mindfulness and meditation, here are some more tips to get you started. See Also: Can Meditation Make You a More Successful Entrepreneur? As counterintuitive as it may seem, there is some evidence that cannabinoids in marijuana essentially slow down the neural transmission in people with ADHD, allowing them to better concentrate. When you consider the sedative effects on non-hyperactive people, it makes a little bit of sense. That said, this evidence is the product of one small study, so while the research is promising, I wouldn’t necessarily run out and buy a joint hoping to increase your focus just yet, even if marijuana is legal in your state. Regular marijuana consumption, while of course controversial in its own right, has also been linked to poor memory, and attention problems. Ultimately, no matter what our habits are, the nature of the way we work today might mean that struggling to sustain concentration amidst tons of distractions is part of the new normal. That said, 20 years ago no one would have imagined the way technology would shape our lives and stunt our ability to focus.